Protects against your melting tanks tipping, sliding and/or falling off your work bench. Protects you, your workers, and your equipment from molten candle wax. Reduces the chances of workplace accidents and damages. Comes in 3 Sizes to Fit all your Melting Tanks and have up to a 3000 lb capacity! Proprietary bumper softens, molds and adheres to melter as melter is heated for secure, safe fit without messy, permanent adhesives or tapes. Padded ratchets with convenient, molded handles resist heat and make gripping and tightening easier. Rugged, heat resistant safety straps resist the heat of continually used melters. Rubber-coated hook make easier to handle and lock into place to secure tank. All Tank-Guards Quickly & Easily Mount to Our Product Support Tools (come included with EZ-POUR & AUTOSHOT SYSTEMS, but can be purchased separately) and most securing devices. It is important to secure candle wax melting tanks against earthquake damage. 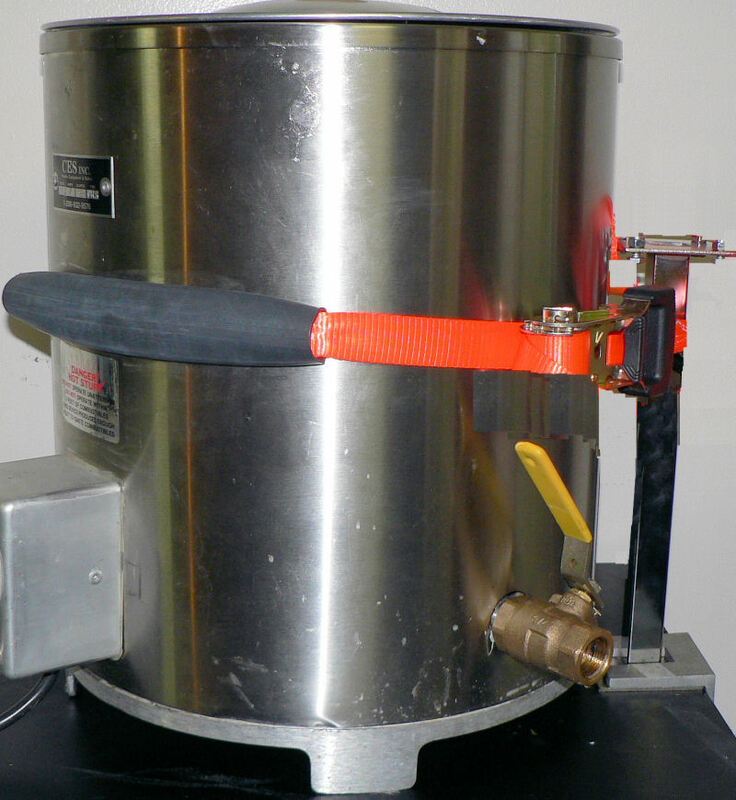 If your wax melting tank is not secured to the wall, they are likely to fall and/or tip during an earthquake, which could dent and damage the melter, as well as jeopardize the safety of your workers and workplace if the melter or its molten wax should fall on someone. WaxMelters' Tank-Guard ES are California State Architect approved restraining devices and rated to protect against earthquakes. Our earthquake strength Tank-Guard ES meets all <?xml:namespace prefix = st1 ns = "urn:schemas-microsoft-com:office:smarttags" />California, Oregon and Washington State Codes. Must Be Mounted To Wall Studs. Why Wait For An Accident? Start Protecting Your Candle Making Business Today!